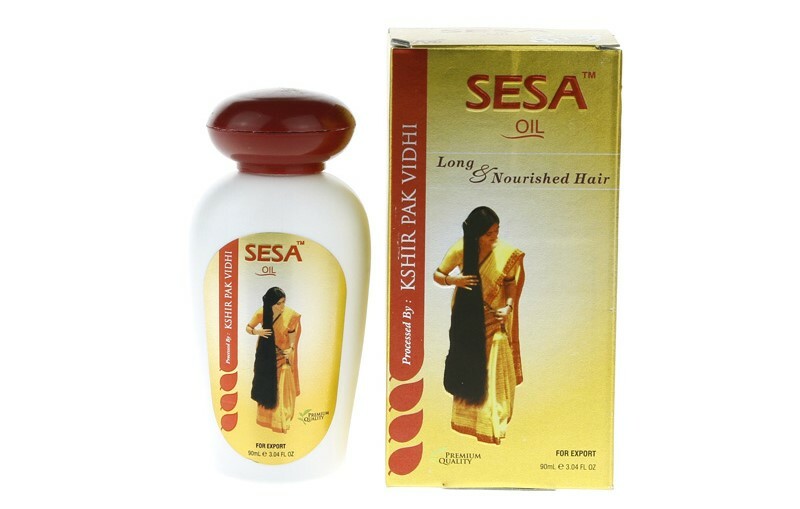 Sesa Oil is one of few oils for hair growth, that combines Indian plants extracts and vegetable oils. All ingredients are known for ages in Indian traditional medicine, so called Ayurveda. Sesa Oil is based on powdered Indian gooseberry (triphala), also known as amla. There are plenty of bringaraj oil, jasmine extract, sesame oil, cardamom, valerian, coconut oil and Indian Lilac fruits extract. This cosmetic combines extracts from 18 Asian plants with truly interesting properties. Great plus to the manufacturer for Sesa Oil not containing harmful substances and being based exclusively on obtained natural ingredients. Thanks to high content of vitamins C and E, Sesa Hair Oil nourishes hair and strengthens them from the roots. Such diverse composition makes Sesa Oil Long & Nourished Hair hold regenerating and beautifying properties (provides gloss, softens, makes combing easier and hair more bouncy). Regular hair oil treatment with Sesa oil increases resilience of hair, which gain additional protection. However, this is not the most important thing about it. This is the best oil for hair growth, because it stimulates hair to grow stronger, thicker and longer. Contained in it oils inhibit falling out of hair, eliminate grey hair problem and dandruff. Combination of almost twenty extracts and vegetable oils makes Sesa Oil Kshirpak Vidhi work on hair in a complex and multidimensional manner. Hair growth stimulating Sesa is an interesting position thanks to its composition and properties, but sadly, not when it comes to the formula. At first sight white plastic packaging is nothing special. It is rather better not to put it on the bathroom shelf, because it is just ugly. On the other hand, it lies in hand very comfortably, but lacks precise applicator, which makes its use a bit difficult. Especially due to runny consistency of Sesa Oil. Here, yet again, as it was with Dabur Amla, appears problem of smell. Sesa has very unpleasant, intense scent, that reminds of bathroom cleaning agents. It is extremely difficult to last with it on the head for a longer period of time and its aroma can unfortunately stack with you if oil is used more frequently. Light clear oil with greenish colour is difficult in application due to two reasons – lack of pump or atomiser and exceptionally runny consistency. For this reason, this hair growth enhancing oil is less efficient, because despite its absorption you need to take twice as much.